1. Check-in time is 3:00 p.m. and after. Checkout time is 1:00 p.m. or before. Late Check-out is available based on availability of your site ($5.00 for 2 hours) Please inquire in the office. 2. Quiet hours are from 11:00 p.m. to 8:00 a.m.
3. The speed limit throughout the resort is 8 mph. We will strictly enforce this speed limit. 5. The testing, repair, other than minor repairs, or tuning of vehicles is not allowed in the resort. 6. Individuals without a current driver’s license may not operate any motorized vehicle in the resort. 7. FIREWORKS ARE NOT ALLOWED IN THE RESORT. 8. FIREARMS ARE NOT ALLOWED IN THE RESORT. 9. Parents are responsible for the actions of and the safety of their children. Adult registrants are responsible for the actions of all of the occupants, guests and invitees of their unit/vehicle in the resort. 10. Skateboards, bicycles and roller blades may be used during daylight hours only. 11. Clotheslines are not allowed in the resort. Drying racks attached to Rv are permitted on temporary bases. Please take towels and swimsuits down when dry. Laundry facilities are available for your convenience. 12. All sewer hoses must have a watertight rubber collar. Please ensure that all of your hookups are in good working order. 13. Please maintain your RV site in a clean and attractive manner. All trash, bottles and cans must be properly and regularly disposed of while you are a guest in the resort. Trash pick up daily at 10:00 am. After that time please dispose of your trash in dumpsters located at the south end of Midnight Pass. Do not leave trash out over night. 14. Campfires are only allowed in designated fire pits. Firewood may not be brought into the resort. Wood is available for sale at the office. Campfire must be attended and under control at all times. Garbage should not be burned. Do not stack firewood on landscaping. Stack on concrete. 15. All of the buildings in the resort are smoke-free. Please properly dispose of cigarettes in designated receptacles. 16. All RV sites must be left in a clean condition. 17. Cutting of trees is prohibited. 18. All visitors must register with the office before entering into the resort. 20. No tents, screen rooms, pop-ups or canopies. 21. Only one RV unit per RV site. 22. All RVs must be 28-feet in length, 10 years or newer or in like new condition. 1. Pets must NOT be left unattended anywhere in the resort. 2. Pets must be on a leash when outside of the RV Unit. 3. Excessive barking and/or aggressive behavior will not be tolerated. If the individual responsible for the pet does not properly address and/or cure the problem, he/she will be asked to leave the resort immediately. 4. A maximum of two (2) pets are allowed per site. Unless approved by management. 5. Aggressive breeds of dogs are not allowed in the resort. All pets subject to approval of management. 6. Pet waste must be immediately and properly disposed of in a sealed plastic bag. 7. Pets may not be allowed to run loose in the resort. Inquire in office for location of supervised unleash area. 8. Pets are not allowed in pool, buildings or playground areas. 1. 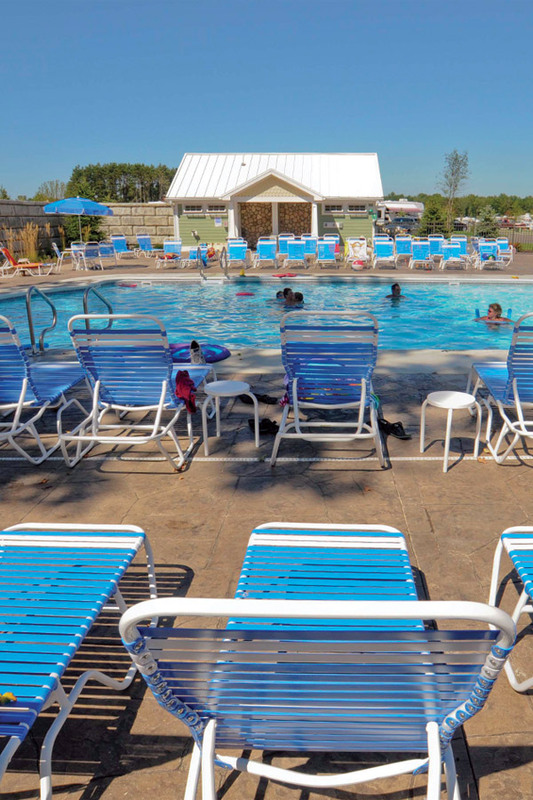 Pool hours vary with the season. Please check the notice by the pool for the hours of operation. 2. A LIFEGUARD WILL NOT BE ON DUTY IN THE POOL AREA. SWIMMING IS AT YOUR OWN RISK AT ALL TIMES. Pool monitors may be present, but these individuals are not lifeguards. 3. NO DIVING OR RUNNING AROUND THE POOL. 4. Proper swimming attire must be worn in the pool. Cut off shorts are not considered proper pool attire. Children who are not “potty trained” must wear swim diapers. Lil Swimmers available at the office for $1.00 each. 5. Children under 12 years of age must be accompanied by an adult. 6. All persons MUST use on-site showers immediately prior to entering the pool. 7. Glass objects, including but not limited to bottles, are not allowed in the pool area. 8. NO ONE UNDER THE AGE OF 12 ALLOWED IN HOT TUB. NO EXCEPTIONS! *The management reserves the right to evict anyone for behavior detrimental to the resort and its guests or for failing to observe the rules of the resort. **Rules are subject to change.